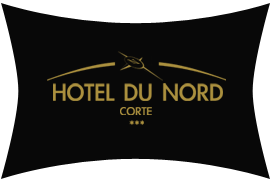 Located in the centre of Corsica, the Hôtel du Nord welcomes you in a friendly setting. This cheap hotel offers you a dream holiday! Hôtel du Nord offers services adapted to your needs. Book one or more of our rooms for your couple getaway, family stay or other types of trips. You can choose between a family room, a standard double room and other types of rooms that might be more appropriate for you. In terms of comfort, we provide you with air conditioning, satellite TV, telephone, and a Wi-Fi connection. You will certainly be satisfied with the quality of our services, especially in relation to our room rates. The oldest hotel in Corte, our hotel was once a stagecoach post. Our doors are always open whether you are looking for a few days' visit or a longer stay on Île de Beauté. Located at only 1 hour from the port of L’Île-Rousse, the hotel offers many places to discover in the surrounding area such as museums, natural treasures of the country, etc. We leverage our experience to make sure you have the perfect stay. We will recommend activities based on your wishes.